Trump overstates what he's 'accomplished.' Again. The tendency to puff up his success served him well in marketing Trump brands long before he became president and has been a central element of his political persona. WASHINGTON — President Donald Trump never gets tired of declaring that he's winning. He's often said that he won the popular vote in 2016, though he lost by nearly 3 million ballots. His re-election slogan, rolled out less than 14 months into his presidency suggests a job already done — "Keep America Great." And on Saturday morning, he declared "Mission Accomplished!" in a tweet about limited airstrikes designed to degrade Bashar al-Assad's chemical weapons capabilities. The tendency to overstate his success served him well in marketing Trump brands long before he became president and has been a central element of his political persona in the White House. The narrow achievement of executing a single military operation demonstrates just how much Trump needs every victory he can declare at a time when the FBI just raided the offices of his personal lawyer, he's still fending off special counsel Robert Mueller's investigation of his campaign and possible obstruction of justice, his agenda is stalled in Congress, his major legislative triumphs promise to greatly exacerbate the debt he vowed to eliminate and his approval ratings remain underwater. On the international stage, he's recently ignited a trade conflict that threatens to hurt both the manufacturers and farmers he said he'd help on the campaign trail, as well as the Republican candidates who hope to represent them in the House and Senate next year. They might get tired of Trump's version of "winning" the trade fight sooner rather than later. And Syria's civil war is still a human tragedy that has baffled successive U.S. presidents. Trump's Saturday morning declaration was widely seen as both premature and myopic, a literal echo of George W. Bush landing on an aircraft carrier and announcing the U.S. mission in Iraq was accomplished 15 years ago (there were still more than 5,000 U.S. troops in Iraq as of December). Those criticisms of Trump were articulated even by many national security experts who agreed with the decision to use force to punish Assad for using chemical weapons against his own people. David Mortlock, who worked on Syria sanctions policy at the National Security Council and the State Department during the Obama administration, said it's right to "exert costs" on Assad but only if it's part of a broader strategy by the U.S. and its allies to bring closure in Syria. "For the missile strikes to actually achieve the mission, there’s got to be an intense diplomatic effort to achieve the outcome we want, which is the end of the civil war," said Mortlock, a partner at Willkie Farr & Gallagher. "If the mission is peace for Syrians, it is definitely not accomplished." 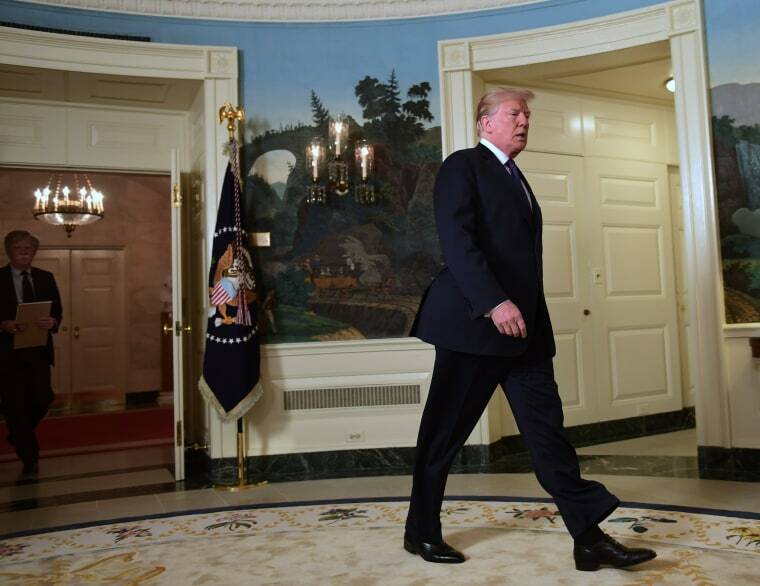 Kenneth Roth, the executive director of Human Rights Watch, also noted that last year's attack on Syrian assets by Trump didn't dissuade Assad from using chemical weapons and that the Syrian leader is no closer to facing a war-crimes tribunal. "What mission accomplished?" Roth wrote on Twitter. "Are Putin-Assad suddenly going to stop targeting civilians (main cause of civilian death)? Is Assad any more likely to stop using chemical weapons than he was after the U.S. retaliatory attack a year ago (when he kept using them)? Is Assad in The Hague?" Trump's mission was accomplished in the narrow military definition of the term — the buildings the U.S. wanted to destroy were destroyed, with no apparent civilian casualties or damage to Russian troops. The strike may have "degraded" the Syrian chemical apparatus, as the Pentagon put it, but it is not clear by how much, and or how long it will take Assad to rebuild. Pentagon spokeswoman Dana White acknowledged Saturday that the strikes were focused on a single goal and do not "represent a change in U.S. policy or an attempt to depose the Syrian regime." But for Trump and his Cabinet, the military strike offers enough to represent a demonstration of the president's break with an Obama administration that failed to convince Congress to authorize military force in Syria and chose not to use the power of the Oval Office to execute attacks without that explicit permission. "I spoke to the president this morning and he said if the Syrian regime uses this poison gas again, the United States is locked and loaded," U.S. Ambassador to the United Nations Nikki Haley said Saturday before throwing shade at Obama for not retaliating when Assad crossed his famous "red line" on chemical weapons use. "When our president draws a red line," Haley said, "our president enforces the red line." But that's a very thin red line in an otherwise clouded picture for the Trump presidency right now.